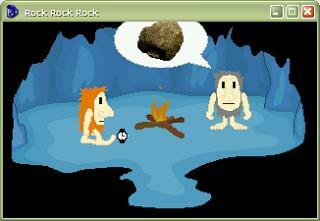 Ug and Og, two cavemen, are getting somewhat bored of their game "Rock, Rock, Rock" as it always seems to end in a draw. If onkly someone could invent paper and scissors, the game would take on a whole new lease of life! MAGS Entry for October 2008. "Endearingly silly, and well executed, MAGS entry. Over in a flash, but clever use of minimalist interface." There are very nice ideas in this game, cute graphics and slick scripting. Too bad it is so short!